Can Catamaran Sailboats Make Good Offshore Cruising Sailboats? Do Catamaran Sailboats Make Good Cruising Boats? 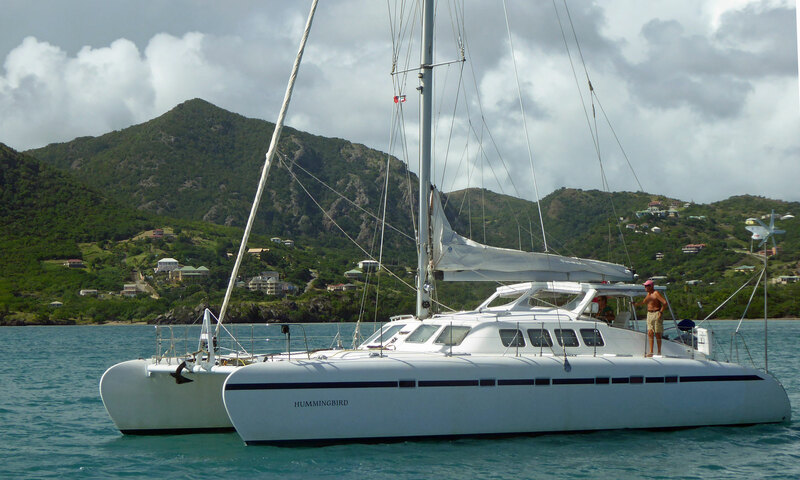 With accommodation in both hulls and the central structure, catamaran sailboats have certainly got ample space below to make good cruising homes - but not all of them make good long-term cruising sailboats. And catamarans work better in some parts of the world than others. In the Caribbean for example, where they're very popular, safe leeward anchorages abound - so there's little reason to tie up in expensive marinas. In other parts where safe anchorages are not so easy to find, mooring your catamaran in a marina can be pretty expensive. Expect to pay double what you'd pay for a monohull of similar length overall. Charterers though, looking for a spacious floating home for a few weeks that doesn't heel over, love them. Their ability to sail upright, together with their commodious accommodation makes them very attractive to the bareboat charter market. The temptation is for the catamaran manufacturer to pander more to the lucrative charter market than the prospective cruising owner, and maximise accommodation - and hence the income for the charter company - to the detriment of everything else. 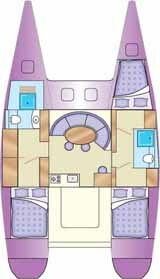 Three separate cabins, each with a double berth, is the norm in a 38 foot catamaran sailboat designed for chartering. Unlike a monohull, these double berths stay reasonably flat and level when underway, so individual seaberths with leecloths aren't necessary. In multihull sailboats of this type, the bridgedeck is often set low to provide standing headroom in the saloon, when it would be better set higher to enable waves to pass unhindered beneath it. The resultant noise and slamming when underway is not something that can be easily ignored. 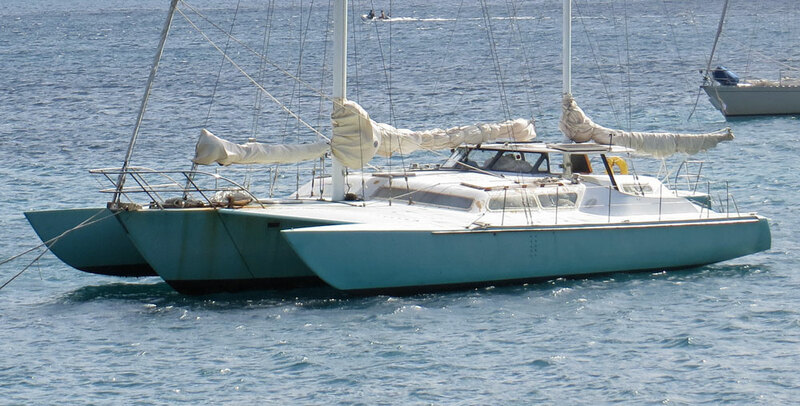 The windage of these bungalow-proportioned multihulls has lead to the catamarans' reputation as a poor windward performer, and this is particularly so when reefed down in heavy weather. Overloading catamaran sailboats will, as with all light displacement sailboats, decrease the Sail-Area/Displacement Ratio and spoil performance. Consequently small, high volume cats, when loaded with the equipment for offshore cruising can become, well, dogs. And it's for this reason that, in my opinion, long-distance cruising catamarans only begin to make sense at around 45 feet. On the wind, owing to their minimal draft, catamarans can make considerable leeway. Most have vestigial keels to resist this tendency, but those designed to really tramp on have daggerboards. At sea, their inability to absorb the small variations in the wind by heeling gives them a peculiar, lurching movement which can be a bit disconcerting until you get used to it. 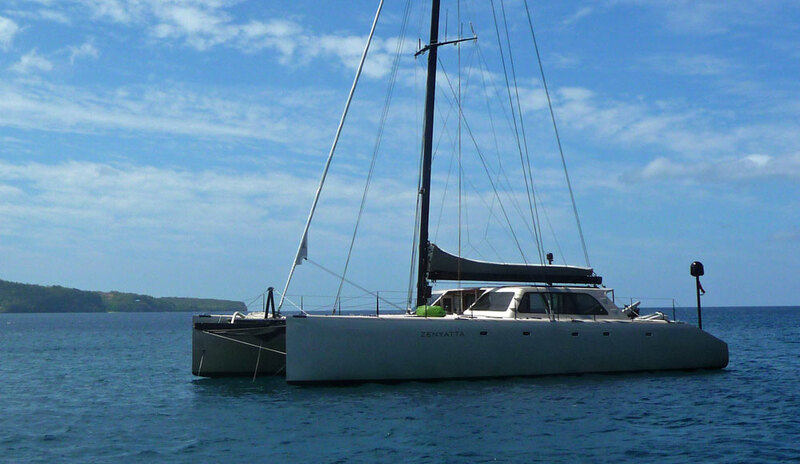 'Hummingbird', a Freebird 50 catamaran designed for long-distance cruising. But a properly designed catamaran from the board of a designer unconstrained by the requirements of the charter market can make a fine cruising boat. In reasonable conditions a well-sailed catamaran can often arrive at an upwind destination earlier than a monohull of similar length - any inferior pointing ability having been compensated by a higher speed through the water and resulting VMG (Velocity Made Good). Under power, a catamaran's manoeuvrability can be remarkable. If they have an engine in each hull, putting one astern and the other ahead will turn a catamaran sailboat in its own length with ease - a redeeming feature in a marina, where you're likely to attract a hefty surcharge for a berth. As a pure sailing machine, a cruising trimaran will beat a cruising catamaran sailboat of the same length hands down. 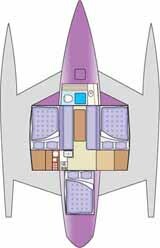 But squeezing the same number of berths into the trimaran of a similar length will mean that the living accommodation below will be disappointing. To all, that is, but a small crew that enjoy sailing really fast and are willing to accept spartan living conditions below decks.